...is a creative response to living alone in a Flat. The absence of interaction with others, led to exploring ways of relating to domestic space in a way that was emotionally uplifting. 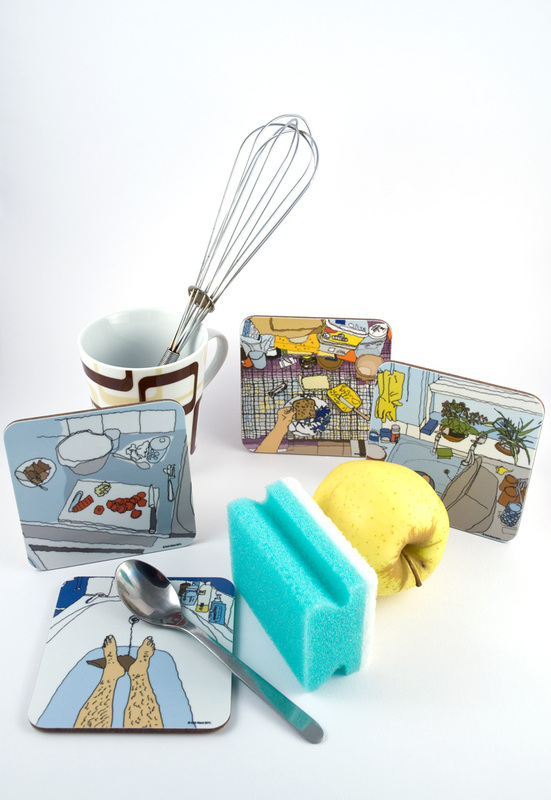 Without a creative response, looking at a washing up bowl 3, 4 or five times in a day – every day – becomes tedious! 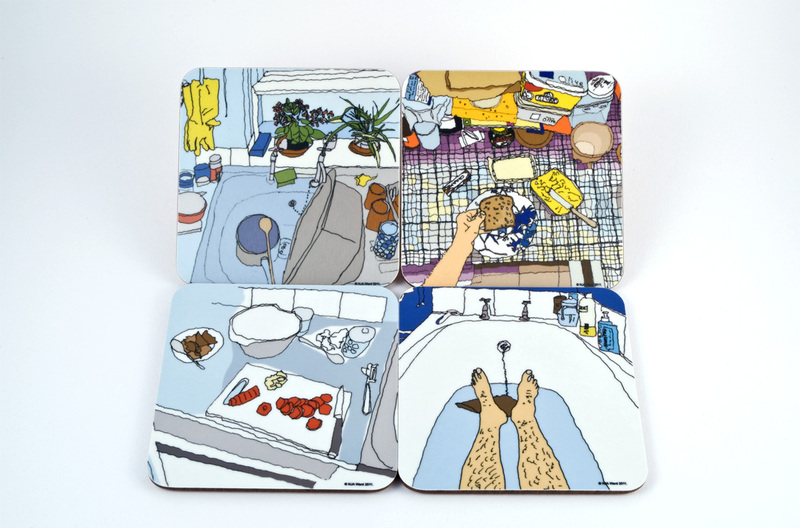 'Flat Life' is a growing series of illustrations (currently 17) reflecting perspectives of a living environment that are ordinary, mundane and commonplace – but are perspectives of living viewed, by most people, often several times a day for the rest of their lives. Although commonplace, they are paradoxically also glimpses of experiences that are, strangely enough, often very private i.e., pouring water from a kettle, glancing at a plate of food, seeing clothes lying across a bed. I hope that by recognising, distilling and presenting them in this slightly 'quirky' way (the geometrical perspective is deliberately altered, the line is knowingly 'childlike' and the colors are intentionally simplified), this series will offer an interesting and amusing way of relating to these experiences. 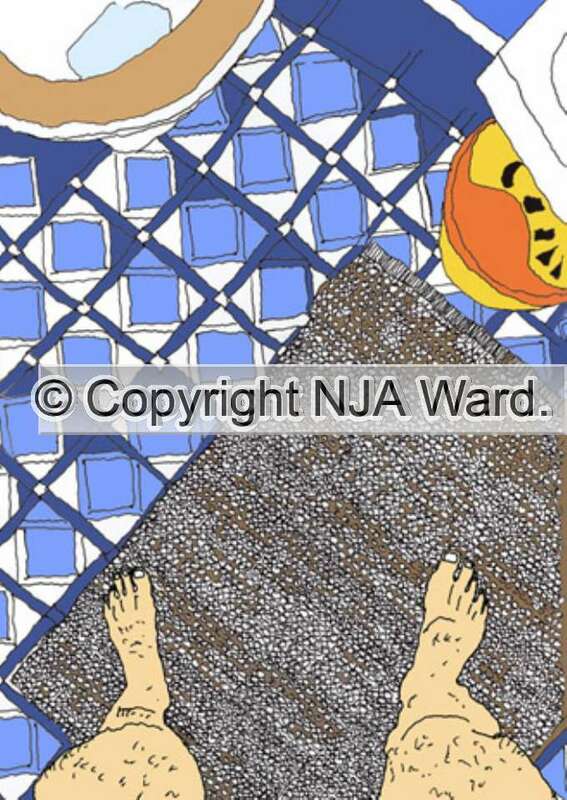 'Flat Life' was first exhibited at York Open Studios 2011. Exclusive items that featured in the show are shown below. 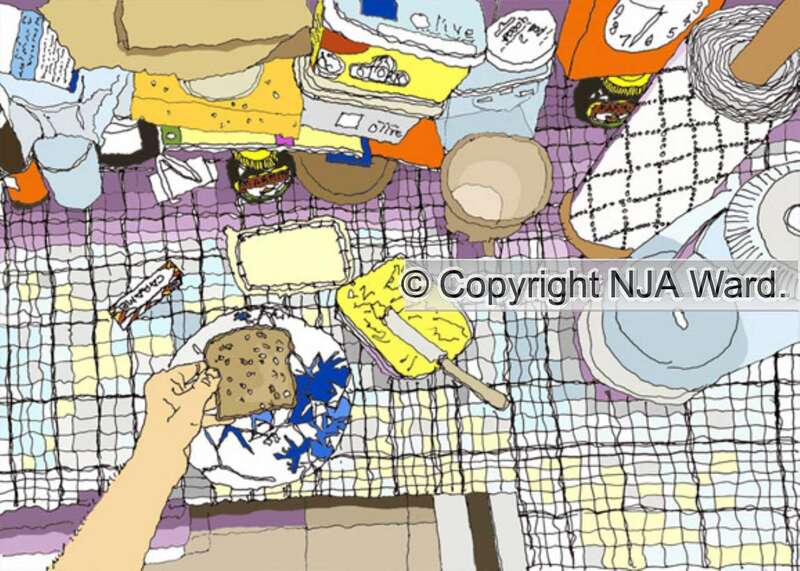 Neil exhibited 'Flat Life' in Copmanthorpe alongside printmaker Emily Harvey and ceramicist Jill Ford. This delightful set of six fine bone china mugs, each featuring a different illustration from the 'Flat Life' series, has been produced exclusively in the U.K. by one of this countries leading china makers Hudson & Middleton of Stoke-on-Trent. 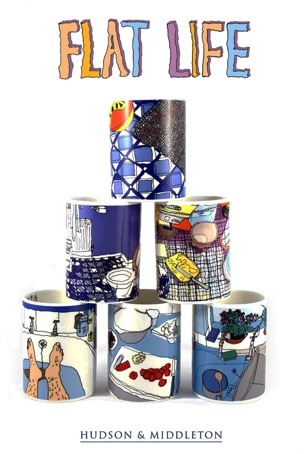 Each mug is approximately 4 inches high and features a motif on the inside and handle. Neil worked closely with Hudson & Middleton in order to ensure that each illustration transferred perfectly to the shape of the mug. The result is a stunning collection that is unique, humorous and original. Limited Edition (100 only of each design) Giclée prints in 14" and GIANT 30". Giclée - from the French meaning 'nozzle' - refers to a modern process of using archival ink pigments and paper to produce the highest possible reproduction of an original artwork. 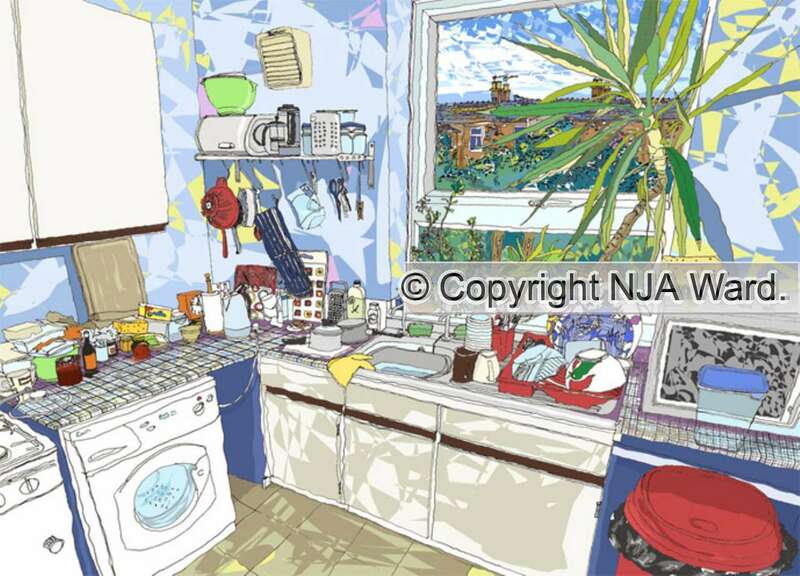 Flat Life illustrations are all hand-drawn before being scanned at the highest resolution into a computer, where they are then digitally hand-coloured. The final digital file is then input directly into the Giclée printer - resulting in an image that is unbelievably crisp and sharp with colours that are simply stunning. Only after Neil has closely examined each print, is it given it's unique edition number and signed. Neil has regularly rejected even seemingly high quality prints, because of minor imperfections. Because of their size, the 30" editions required special attention in order to ensure the highest possible quality. "The correct frame is, in my view, often as important to the final result as the art itself! I source very high quality, individually adjusted aluminium frames. In my experience, 'off the shelf' frames can cause a lot of problems. All my illustrations are mounted using conservation grade materials - even the mounting tapes. I prefer the frames to include optically clear, scratch resistant acrylic glazing - which has been coated to block 97% of all UV rays - meaning the illustration is better protected. All of which, means the illustration will last a lifetime... and beyond"
The frames are designed to compliment the illustrations beautifully. However, should you prefer a different style, colour, shape or design this can be arranged. * Please note: for copyright reasons some images on this page have been heavily reduced in quality and are intended as a guide only. 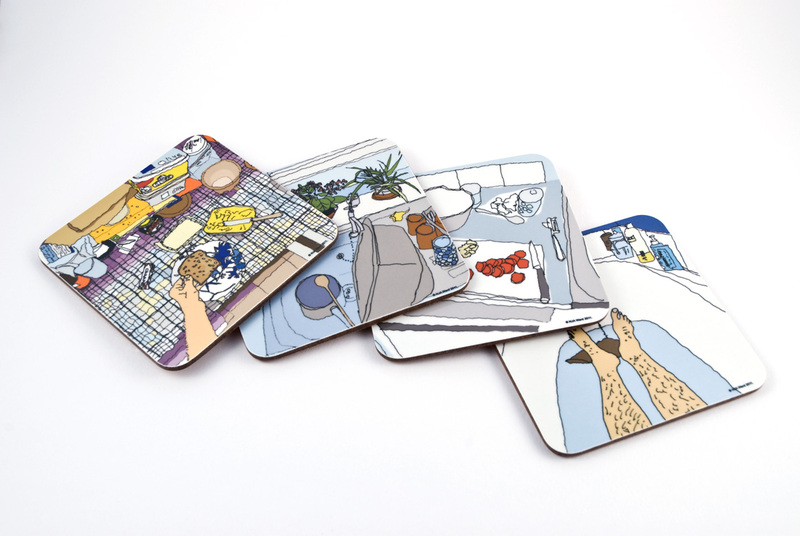 A delightful set of 4 high-quality melamine coasters. Neil worked closely over many weeks to oversee every detail with a reputable UK manufacture to produce a LIMITED quantity of these novel, unique and fun coasters. They are presented in their own clear wallet and are made from the highest quality melamine with a cork backing. •	Feet in the Bath! The illustration is not painted or transferred on, but BAKED into the surface. 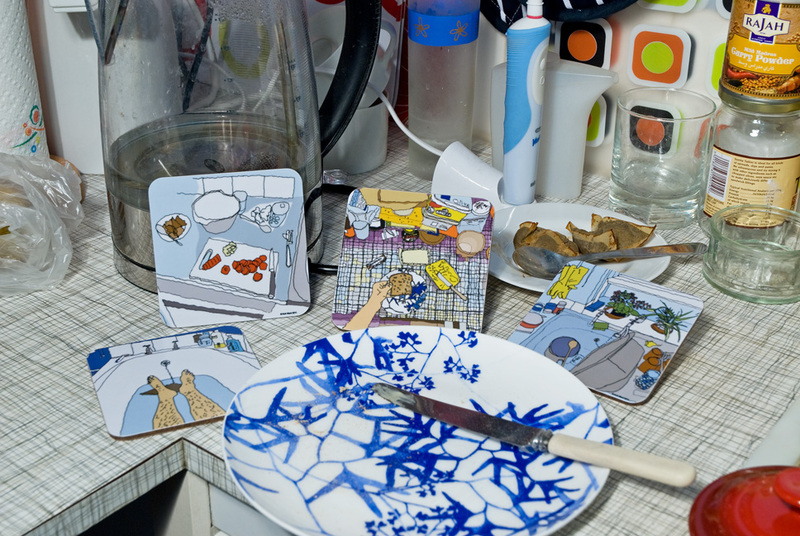 This means, that the images on these coasters will last many years without fading! Hand-made EXCLUSIVELY FOR York Open Studios 2011, a unique resin cast model of 'Feet in the Bath'. "I felt the need to try something different. It has been important for me to push myself by using new methods and techniques whilst, at the same time, seeing if I could produce something that retained a freshness to it. 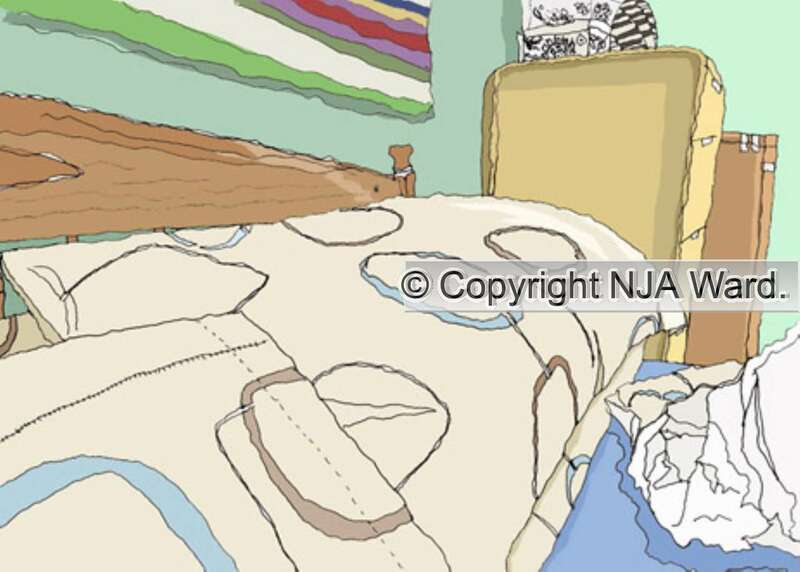 I hope that the finished result - like my illustrations - looks simple. The irony, of course, is that it took many weeks and thousands of individual steps to produce! At this stage the model is probably too costly to reproduce; however, I welcome interest".